Last week, I was traveling to and around Philadelphia for work (which was the reason for my absence of a post last Tuesday). While in the City of Taserly Love, I was fortunate enough to catch a baseball game at Citizens Bank Park, the relatively new home of the Philadelphia Phillies. With pretty much every seat providing a good view of the field and the focus directed towards what happens on the field, it's a very pleasant, no-frills ballpark... but with one noticeable blight: the presence of the Phillie Phanatic. This embarrassing creature is not only an offense to reason and logic; he's also a liability. 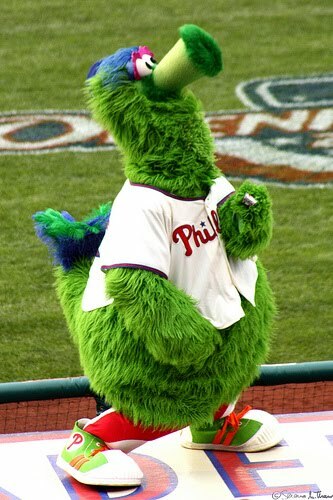 Despite his place in the Hall of Fame (one of only three mascots currently enshrined) and his title of "Best Mascot Ever" (according to Sports Illustrated for Kids), he is also the most sued mascot in sports: he once cost the Phillies a $2.5 million settlement for injuring a civilian at a paint store event. He also has a history of assault (or, more specifically, being assaulted) and extortion - when ownership of the Phillies changed hands in 1983, the Phanatic's designers sold his copyright to the team for $250,000, more than 48x what the Phillies could have paid for the copyright ($5,200) upon the character's creation five years earlier. Remember the five multi-colored Friendlies (or Fuwa) from the Beijing Olympics? Each one represented one of the Olympic Rings and embodied a specific part of Chinese culture. The coolest gimmick about these guys, though, was the fact that if you took the first syllable (or the second; they're both the same) from their seemingly nonsensical names and put them all together, you get the title of the popular and catchy theme song for the 2008 games: Beijing Huanying Ni (which translates to "Beijing Welcomes You"). Okay, maybe neither the mascots nor the song were all that popular over here in the states. But if you were in China for the duration of the games (as I was, plus the weeks prior), you couldn't turn around without seeing a billboard or a bus stop plastered with these guys' adorable little faces! The folks who planned the Vancouver Olympics followed suit in the cuteness category. 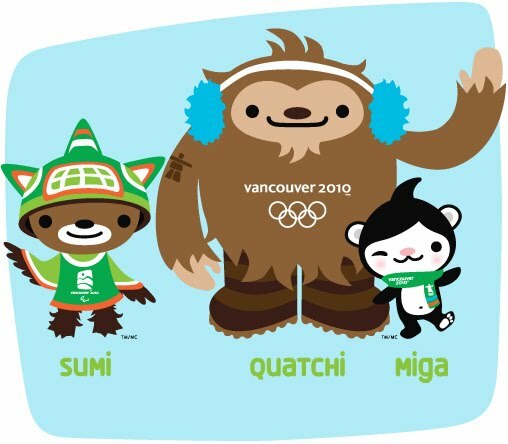 Miga, Quatchi, and Sumi represent mythological creatures (a sea-bear, a young sasquatch, and an animal guardian spirit, respectively) from Canada's *cough* storied and unique culture *cough*. Now I'm all for breaking the mold, but seeing as the Olympic-watching public are now used to cute and cuddly mascots, I don't see how these surreal and creepy images will play. 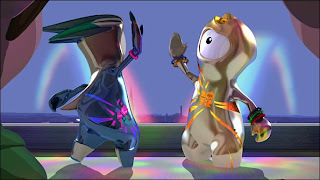 Wenlock and Mandeville are two futuristic Cyclopean figures, with stubby arms and legs, dressed in metallic orange and blue, respectively. Their names have historical meaning: Much Wenlock, a small town in the English county of Shropshire, is widely considered to be the birthplace of the modern Olympic games (founded by Dr. William Penny Brookes in 1850 as the Wenlock Olympian Games). Stoke Mandeville Hospital, located in the English civil parish of the same name, houses the largest spinal injury ward in Europe - and their Stoke Mandeville Games were the inspiration for the modern Paralympic Games. Having weird and scary mascots in and of themselves isn't too much of a problem... except they're specifically marketing them for children! (See their ridiculous backstory of how they were formed from the last two drops of molten steel from the building of the Olympic stadium, and were subsequently given life by a magical rainbow.) They debuted them at a school, for goodness sakes! I'm surprised they weren't carted away, along with the whole camera crew. Plus, they were designed so that their eyes (one apiece) could double as camera lenses, for the purpose of marketing Wenlock and Mandeville shaped webcams, etc. So now they want to encourage these creepy figurines to spy on your kids while they're at their computer! I'd be concerned what "magical rainbow" (read: wireless radio command) would bring the mascots to life inside your own home, leaving them free to wreak havoc while you're sleeping. 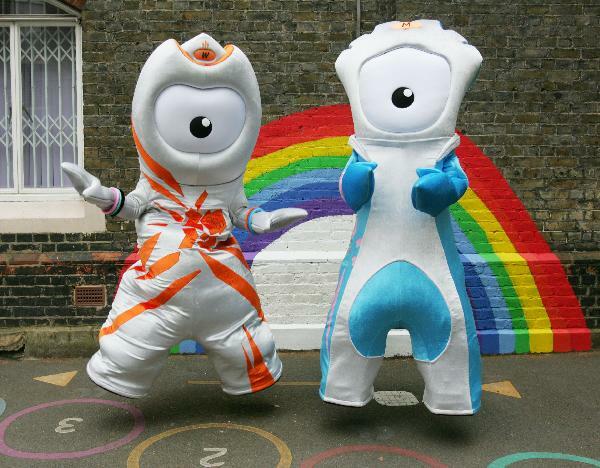 We have two years until Wenlock and Mandeville's games start, and the people in charge are counting on these mascots to raise approximately 12 million pounds towards the 70 million pound fundraising goal of the 2012 games. Not that I want the folks of merry old England to lose money, but I think it would be best for everyone involved if these two atrocities kept as low a profile as possible, and let the focus be on the athletes and the competition. Because I have a feeling that the more time Wenlock and Mandeville spend on television, the more complaints London will have of Olympic-related night terrors.